Pipes around plumbing fixtures create gaps that allow air infiltration and even pests. Place foam sealant straw applicator or gun foam barrel into gaps and fill with foam insulation. Fill opening around pipes slowly to help block drafts. There are scores of small gaps and cracks around your basement, garage and other unfinished areas. When added up, these small cracks can be energy suckers. Place straw applicator or gun foam barrel into gap or crack and lightly spray foam into penetration. Fill seam and trim/paint excess foam. Foam will help reduce drafts, noise and pests. All-Purpose and Fire Break are 1-component polyurethane foam sealants ideal for the professional contractor or serious do-it-yourselfer. 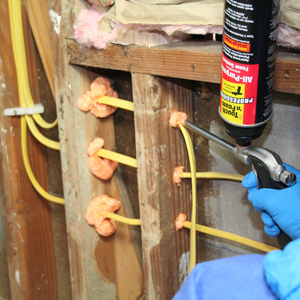 Both foam sealants are Class A fire-rated foams. Plus, they meet ASTM E-814 and E-84 requirements and are listed with UL 1715. Fire Break is the only foam sealant in the industry to pass the UL 94 VO test (self extingushing). Both products work well to prevent the spread of flames between electrical, plumbing and other small penetrations within homes.